Snapping shrimp are among the noisiest animals in the ocean. They produce a loud clicking noise when snapping their claws to stun or kill their prey. Credit: Anker A, Grave S, CC BY 3.0, via Wikimedia Commons. Scientists have for the first time captured the sounds of snapping shrimp off the Oregon coast and think the loud crackling from the snapping of their claws may serve as a dinner bell for eastern Pacific gray whales, according to new research being presented at the Ocean Sciences Meeting here today. Snapping shrimp are typically found in warm, shallow subtropical waters all over the world, but no one had yet detected them in the colder waters off the coast of the Pacific Northwest. But in 2016, ocean researchers deployed a drifting hydrophone - a microphone that records sound underwater - in the shallow waters off the Oregon coast. When they listened to the hydrophone recordings, they noticed something strange - loud popping, clacking sounds characteristic of snapping shrimp. 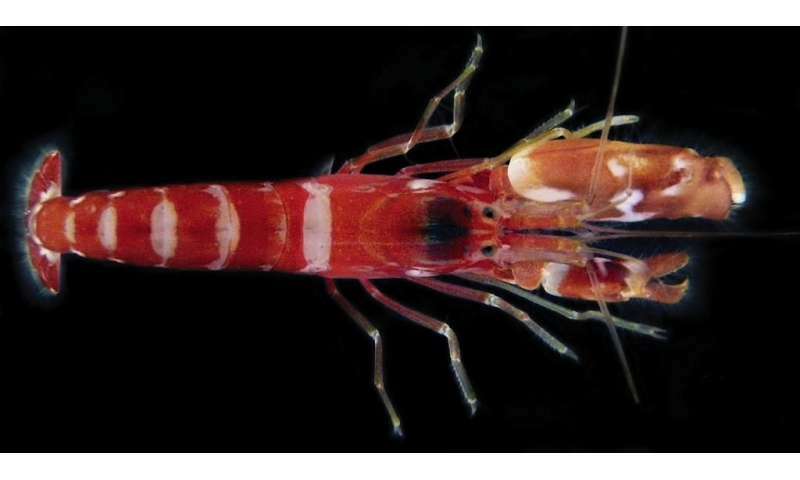 When the researchers compared the recordings to known snapping shrimp sounds, they matched. Listen to a recording of snapping shrimp captured by the researchers here. "Nobody was aware of any sign of snapping shrimp in Oregon nearshore waters ever - they are completely undocumented," said Joe Haxel, a marine acoustics researcher at Oregon State University's Cooperative Institute for Marine Resources Studies and NOAA's Pacific Marine Environmental Laboratory in Newport, Oregon who will present the findings today at the 2018 Ocean Sciences Meeting, co-sponsored by the Association for the Sciences of Limnology and Oceanography, The Oceanography Society and the American Geophysical Union. "That was a surprise, and very interesting to us, because we found areas with our drifting recordings that were just chock full of these snapping shrimp sounds, and they're really loud." Gray whales don't eat snapping shrimp, but they do eat other crustaceans usually found near the rocky reefs. Haxel and his colleagues suspect the loud snaps and cracks could be an acoustic cue to direct whales to areas of the ocean where their typical food might be plentiful. An underwater recording of snapping shrimp sounds in the Redfish Rocks Marine Reserve. Credit: NOAA-PMEL Acoustics. "The ocean is really patchy with prey," Haxel said. "But we're seeing that whales are more concentrated in these rocky reef areas that have kelp and other food sources where the snapping shrimp are also found. So that potentially could be kind of a dinner bell effect." "Whales are very acoustic animals, so we assume that a lot of the cues they get about where food is located is based on sound," said Leigh Torres, a marine ecologist at Oregon State University in Newport and collaborator on the research project. "The ocean is generally a very dark place, especially at night, but these whales feed around the clock. So when they can't see, either because they're in the deep ocean or because it's night, they must rely on other cues, and we think acoustic cues are a primary way of doing that." The researchers are unsure whether snapping shrimp have inhabited these waters for some time or if they've just arrived. If the shrimp are new to the area, it's not clear why they are showing up now. But the discovery of the shrimp and their connection to gray whale feeding grounds could mean changes to the underwater soundscape affect marine animals more than previously thought, according to Haxel. "The co-location of snapping shrimp with particular habitats and foraging prey for gray whales begins to uncover a potentially very important link between the underwater acoustic environment and healthy ocean ecosystems," he said.